I love when plums are in season and even better when they are ripe and ready for the picking. I picked up a punnet the other week while doing the weekly shop and I knew exactly what I was going to make JAM. Plum jam has the softest sweetest taste that you would be forgiven if you eat it straight from the jar. This recipe will make you two jars of plum jam. Bring to the boil then reduce to a medium heat and let simmer until you see the skin begin to peel off. 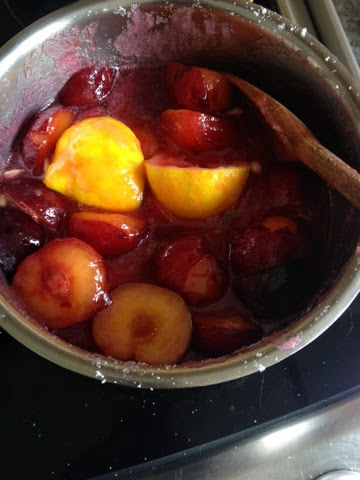 With a wooden spoon stir the plums every now and then. Next add in your sugar and and continue to stir until all the sugar has dissolved. Cut your lemon in half and squeeze the juice in the pot then pop the remains of the lemon in also. As your jam is cooking thoroughly wash your jars and pop them in a pre heated oven at 180 for ten minutes. Let the jam bubble away on a low to medium heat and every 5-10 minutes check the jam on the back of a spoon, if you can run your finger down the center of it and it leaves a line that shows the jam is ready to be jarred. I pushed the plum jam through a conical colinder so as to catch the stones and piths from the lemons. I then spooned the plump flesh from the plums into the jars leaving the stringy fibers behind.